Many people don’t realise the tulip originated in Turkey. Turkey hosted the world’s first Tulip Festival more than 400 years ago, the love for the Tulip and the tradition is still strong in Victoria today. 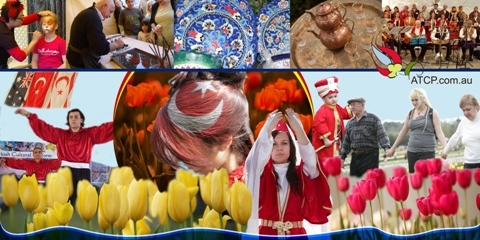 The Tesselaar Tulip Festival’s Turkish Weekend is a showcase of Turkish culture, it is a colourful and exciting weekend. This year’s Festival will once again feature demonstrations of art, dance, music and gourmet food, where Victorians will get the opportunity to celebrate, learn, and savour Turkish hospitality, culture, heritage and cuisine. Without leaving the comfort of Tesselaar Gardens, visitors will vividly experience Turkey. · Enjoy the traditional and modern Turkish culture and textiles, memorable performances of Turkish folk dancesand authenticTurkish music. Don’t miss out on the opportunity to savour Turkish culture and cuisine, so mark your calendars today! 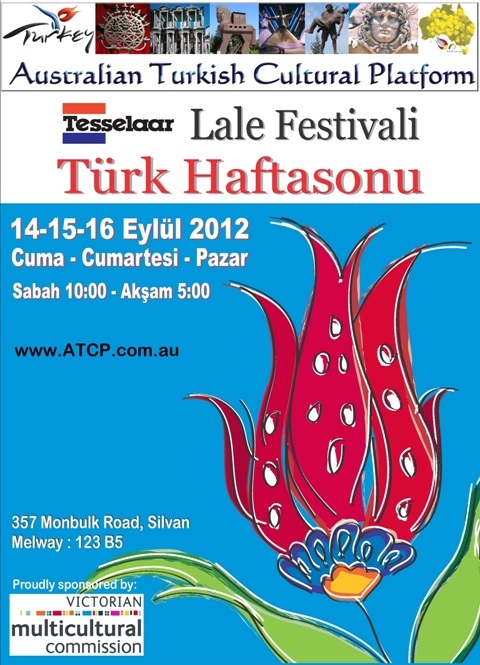 Proudly presented by the Australian Turkish Cultural Platform (ATCP) in conjunction with the Tesselaar Family. Baharın habercisi açan çiçektir. Melburn’da baharın müjdecisi ise Lale Festivalidir. 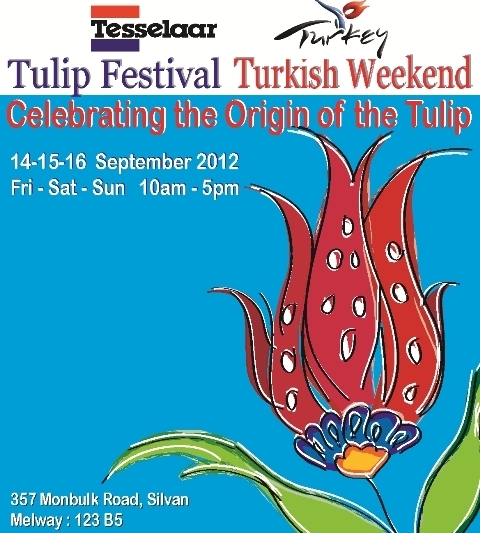 Haftasonu açık hava kültür şenlikleri şeklinde düzenlenen Türk Lale Festivali bu yıl 14-16 Eylül 2012 tarihlerinde “Turkish Weekend – Celebrating the Origin of the Tulip” teması altında Tesselaar Lale Bahçelerinde yapılacak ve böylece Melburn’da 8’inci Türk Lale Festivali gerçekleştirilecektir. Avustralya Türk Kültür Platformu tarafından düzenlenen festival, üç gün süresince Türkiye’den farklı renkler, sesler ve esintiler sunacaktır. This entry was posted on Wednesday, August 1st, 2012 at 9:32 am and is filed under Announcements, Tulip Festival. You can follow any responses to this entry through the RSS 2.0 feed. Both comments and pings are currently closed.